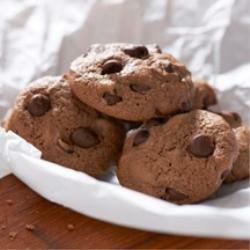 Sweet Country Crock® Double Chocolate Chip Cookie recipe is for all you chocolate lovers. You can never have too many chocolate chips! Preheat oven to 375°. Beat Country Crock® Baking Sticks, granulated sugar, light brown sugar, eggs and vanilla in large bowl with electric mixer until creamy. Beat in flour, cocoa, baking powder, salt and baking soda just until blended. Stir in chocolate chips until every spoonful of dough has some of the chips.